I've peppered (souped? spiced?) a few recent posts with tidbits about the ramen scene here in Tokyo and some of the latest ramen trends, so I figured I'd do a short post just going over some of the recent noodle-related media coverage. A friend tipped me off that the new ish of the magazine Dancyu (I don't know what it means either) is a ramen special issue, so I hunted it down when I popped into Book First in Ginza today. Although I described the substantial ramen guidebook table on display at Junkudô in the last post, magazines like Dancyu fall into a bit different category than your average ramen guide, or even your new-fangled schmancy ramen guide. Dancyu and its cousins are not really magazines for the typical ramen demographic, or even the ramen maniac, but are more like "food lifestyle magazines" for well-to-do men in their 50s. Can you spot the ramen magazine in this lineup? Dancyu's focus in this issue is on "Ramen that you'll never forget as long as you live; ramen shops that you'll keep as a secret for yourself." The scope of a magazine like Dancyu is a bit broader than your average ramen guide - while most ramen-related publications are necessarily tailored for the urban area in which they are being sold, Dancyu is (as far as I can tell) a national publication, and accordingly its top bowls span the whole country, with recommended bowls in as unlikely places as mountainous Toyama on the Japan Sea coast. One interesting varietal I had never heard of before is "Nabeyaki Ramen" (Pot-cooked Ramen), where the noodles are cooked and served in a boiling clay casserole pot filled with meat and veggies. This kind of preparation is popular for udon, but apparently tossing in ramen noodles is a specialty of surfin' mecca Kôchi prefecture. ...to run a three-page feature on...Ramen Jirô?!? Jirô - "ramen for grown-ups." Uhh, that's one way to think about it, since the amount of fat in a single bowl would probably be enough to stop a prepubescent child's veins from pumping. This was next to an article about how to make ramen a part of your life in your 50s. It's official, a "ramen boom" is in full swing. Next door to Dancyu on the magazine rack is another similarly high end "food lifestyle "mag, Shokuraku (The Pleasure of Eating), claiming to provide "all the info you need to become a ramen tsû". Tsû is a hard word to define, but it falls somewhere between "expert," "connoisseur," "dandy," and "someone who knows one's way around." 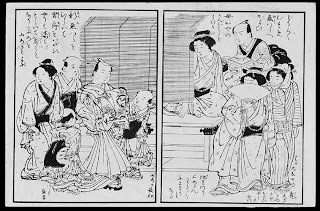 Its most notable usage dates to the Edo period, when it was used to refer to a properly coiffed man-about-town who was enough of a smooth operator to freely work his way around the Yoshiwara licensed quarter and impress everyone he came into contact with. Naturally, there are a lot more people who aspire to be such a man than there are actually men like this. Hence the prevalence of such magazines. I'm being mean, but the truth is these magazines were chock full of interesting info and (perhaps more importantly) mouthwatering photos. The critics in Shokuraku seem to also be calling 2009 as the Year of the Miso. I guess it's been five long years of blended gyôkai (seafood) dominance in Tokyo, with the trend shifting to tsukemen in the past year or two. One interesting point brought up by one of the discussants was the fact that tsukemen (dipping noodles) allow for much quicker seat turnover - since the noodles aren't nearly as hot as traditional ramen served in soup, they can be eaten much faster, allowing the next slurper to be seated (and pay) that much faster. Good business model. It seems like the professional ramen writers have seen enough of Jirô clones, Rokurinsha (seafood tsukemen) clones, Taishôken (the original tsukemen) clones, and enough soupless noodles, and are looking for the next trend, placing their hope with people like Takeda Keisuke of Ebi Soba Keisuke fame. One point one of the critics made is how self-propagating the popularity of certain shops can be - it's often the same shops getting feted over and over again, but there are plenty of good shops that don't seem to be in the "ramen maniac" information loop; he names Ebisu's Tsukumo (home of delicious Hokkaido Cheese Ramen) as an example. Rameniac makes a similar point in his recent post on "Official No. 1 Shop" Menya Kissô in a - are these shops really that good, or are people just following the crowds? Each voice and opinion on ramen (or any other matter) is a subjective one, and one man's tonkotsu may be another mans shôyû; likewise, good critics are the ones who take such matters into consideration. For what it's worth though, Sapporo Junren in Baba got another #1 Miso ranking, so that probably explains the lines I've been noticing. -二郎 (Jirô) in Kannai, Yokohama - Soupless Jirô! I saved the most exciting news for last though...the Ramen Girl movie is coming out in ten days! I guess this has been floating around the electonic gossipsphere for a while, but it is definitely happening, and it will definitely be playing in Shinjuku starting Saturday the 17th. Brittany Murphy (from Clueless and, uhh, the Eminem Movie) is an American girl in Tokyo who ends up training to become a ramen cook after getting dumped by her boyfriend. Her foil (and no doubt the true star of the movie in Japanese viewer's eyes) is the Tsuri Baka (Fishin' Fool) guy, Nishida Toshiyuki, who is kind of like a Tora-san for the 21st century. 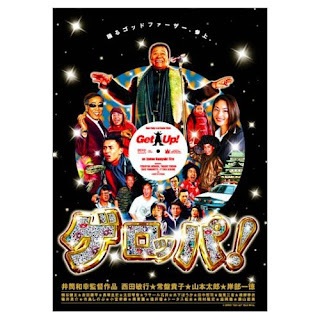 You may (or may not) remember him from his role as the James Brown-obsessed Yakuza godfather in "Geroppa!" (That's Japanese for "Get Up", as pronounced by the Godfather of Soul). As a fun bonus, the trailer includes music from Asobi Seksu! To be honest it looks pretty cookie-cutter, and since it's directed by an American, I wouldn't be surprised if there are as many cliches as there are toppings in a bowl of Hakata ramen. Nonetheless, I'm sure it'll be lots of fun, and I'm definitely going to watch it. I haven't decided if I'm going to go to the grand opening screening, but you can be sure that I'll post my thoughts after I see it. The web is definitely abuzz, and who knows, maybe it'll even get a limited release in America - it's starting to get some media coverage. It is an exciting time to care about ramen!